that you build little houses for in the forest. These kinds are powerful and dangerous. at risk: her best friend, Seth; her life; everything. Aislinn is stuck between two relationships – Seth, who she cares for deeply, and Keenan, the faerie summer king, who needs her help. When she is forced by Keenan to choose between them, she is conflicted. She doesn’t want to choose Keenan but if she doesn’t, something bad is going to happen to her. She’ll become something miserable and with live the rest of her life in cold pain. Melissa Marr writes the story from Keenan’s point of view and Aislinn’s point of view. 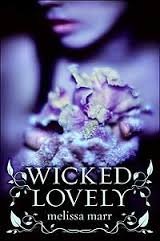 If you enjoy reading romantic fantasies, then you’ll love reading Wicked Lovely.